Two days before I was scheduled to fly to El Salvador for my third Thrivent Builds-Habitat for Humanity trip I got an e-mail from our State Department warning me of escalating concerns about safety there for U.S.A. travelers. Were this my first trip I might have cancelled my flight. Since this was not my first trip, I deleted the e-mail and continued packing. Both Thrivent (a not-for-profit financial services organization for Christians) and Habitat in El Salvador run excellent programs. The work, though physically challenging, is manageable. We get two breaks and a long lunch plus encouragement to rest when we’re feeling tired. Our task was to help dig an eight foot-deep hole and deepen a trench around the house for a new septic system at a Habitat home. We spent much of the week moving dirt out of the way and then moving it back in to fill in around newly laid pipes. The week wasn’t all work. Habitat encourages getting to know the Salvadorians we met. For that reason each work site includes an interpreter. This is essential as the building project managers are hired for their construction skills and ability to work with international volunteers, not for their English skills. Some volunteers speak Spanish, but few have an adequate vocabulary to negotiate building instructions. One of the Habitat workers was a young man, David. At one point David was pitching dirt out of the pit that was now deeper than he was tall. He could pitch dirt out faster than five volunteers could load it into a wheel barrel and haul it to the empty lot next door. One young local woman, Glenda, came by every day to help because she wanted to practice her English. I wanted to practice my Spanish so we spoke to one another in both languages frequently during the week. I was immediately drawn to Glenda as she is the same age as two of my granddaughters. Luis Viscarra is the Habitat staff person charged with welcoming each international team at the San Salvador airport. He gives each team a brief history of El Salvador along with practical tips for staying healthy and safe while in country. He starts by explaining that when Spain conquered El Salvador several centuries ago the country was divided up among fourteen colony families. By the time of the 1980s’ Civil War, descendants of these original fourteen families literally owned all of El Salvador. These few were wealthy while the majority of people were living in desperate poverty. The Civil war broke out in 1979 when the military-led government, representing the interests of the fourteen families, fought against a coalition of guerrilla groups fighting for a more equitable distribution of the country’s resources. Many fled during the twelve-year conflict. Both sides recruited child soldiers. There was extreme violence, including deliberately terrorizing and targeting civilians via death squads. Martyr Oscar Romero, a Catholic priest, campaigned on behalf of the poor. For his efforts he was assassinated in March 1980 as he led worship. We saw photos of him everywhere, including on the stole of Lutheran Bishop Medardo Gomez who presided over worship at Iglesia Luterana Cristo Rey (Christ the King Lutheran Church) in Santa Ana, our first Sunday there. The years of extreme violence and the disruption of families as many fled the twelve years of extreme violence have resulted in a generation of young men who have grown up inadequately educated but with much experience of violence. That combined with extreme poverty, has led to the formation of gangs. So yes, gangs are a serious problem in some parts of El Salvador. However, Habitat leaders know where they are active and keep the international volunteers far away from those areas. Because we were team number 250 through the Thrivent-Habitat of El Salvador partnership, we were given extra special attention. The week started with a worship service at Cristo Rey in Santa Ana. 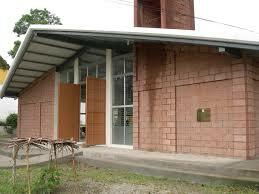 An earthquake destroyed their church building in 2000. For many years the small congregation gathered in an old cinder-bloc building that survived the earthquake. It had originally been a chicken coop. When Joe and Bonnie Reilly started taking volunteers to El Salvador as part of Joe’s work with Thrivent, they took teams to worship at Cristo Rey since many of the homes they worked on belonged to members of that congregation. A few years ago they sat with their team in folding chairs in the cinder-block building and asked Pastor Carlos what he needed most. His obvious answer was, “A new church.” There were only two problems: the congregation had no funds and little hope of raising them to build a new church; and, Habitat for Humanity builds homes, not churches. The best way to handle a problem is to get rid of it. With a lot of prayer and enthusiasm Partners in Faith was formed. Funds were raised. Habitat for Humanity gave permission for teams to slow down on building homes and pick up speed on construction of the much-needed new building. 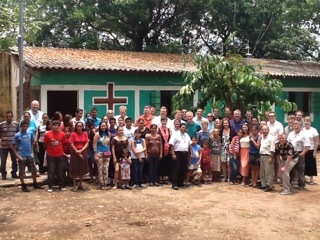 International volunteers and Cristo Rey members worked side by side for several years to build what Bishop Gomez claims is the best Lutheran church in all of El Salvador. As we worshipped on the one-year anniversary of the completion and dedication of the church I held back tears, as did many of my fellow team members. Most of us had played some small part in the construction of the new building. In addition to Bishop Gomez, several other honored guests participated, including the president of a Baptist seminary, an Episcopal priest, two USA Lutheran pastors, and a pastor from Guatemala. Sitting next to me in the pews was the German Lutheran church’s ambassador for Central America. Our team of twenty-seven worked on three housing projects in the planned community of Getsemaní near the town of Ahachapan, in western El Salvador, near Guatemala. We stayed at a lovely lodge resort in the mountains that featured a large dining room complete with dance floor, a miniature zoo, horse-back riding, a spa and swimming pool, a playground and a couple of game rooms. Luis told us that approximately two-thirds of Salvadorians live in sub-standard housing. Thanks to the twenty-five years of effort on the part of Habitat in El Salvador and the volunteer work of a thousand volunteer teams, that situation is slowly, but surely improving. Our media loves to cover violence and corruption. They miss some of the many truly beautiful places we saw on our trip. The people, the food, the hospitality, and the community of volunteers all working on a common mission make traveling to El Salvador well worth the effort it takes to go. Kathy Haueisen is an ELCA pastor who lives in Houston, Texas. She has authored two books and served as editor of two others. Asunder is her first novel. Taking an intimate look at the emotions involved in divorce, it will be released April 2016. Have you ever failed at dieting? A newer book gives an insightful explanation as to why the diet didn’t work; additionally, the same explanation helps us understand why many get stuck in poverty and what might be done to combat its persistence. In a previous blog post, I asked: Do you know anyone who is poor? In our increasingly stratified society, most better-off Americans don’t maintain friendships with people living in economic poverty; nonetheless, many have an opinion about their societal brothers and sisters struggling to get by on less. And – let’s be honest – that opinion is generally not favorable. Scarcity: The New Science of Having Less and How it Defines our Lives, by Harvard economist Sendhil Mullainathan and Princeton psychologist Eldar Shafir, exposes as flawed the opinion that being poor is due mostly to moral failure. Using the term bandwidth to describe fluid and accessible mental capacity, the authors explain how we process information and make decisions. None of us, they maintain, has unlimited mental capacity. As evidence, think about the last time you saw someone texting while driving. The culpable person was either driving ten miles per hour under the limit or weaving in and out of the lane, like a drunk driver. We can only do so much with what we have, especially as concerns texting and driving. Mullainathan and Shafir say that scarcity of differing types (caused by lack of time, money, or other resources) causes tunneling, a concentrated type of focus. Tunneling helps you send or read a text message while driving, but it hampers your driving performance. None of us is as good at multi-tasking as we think we are. Our available brain capacity, or bandwidth, is taxed when we’re doing more than one thing at the same time. Temporary scarcity helps the mind focus and causes it, for better or for worse, to tunnel. If you missed breakfast for some reason, there’s a good chance you’ll get some lunch – your mind and stomach united, focused on the task. Chronic scarcity, however, is always disadvantageous. One’s mental bandwidth is heavily taxed when living in a state of chronic want and need. Mullainathan and Shafir maintain that chronic scarcity hampers decision making; living in poverty constitutes an austere tax on the mind. The co-authors agree with the assessment made by many better-off Americans: specifically, the stereotype of those living in poverty as having a “lower effective capacity” concerning positive decision making for their own health and well-being, and that of their families. But – THIS IS A MAJOR DIFFERENCE – Mullainathan and Shafir attribute the diminished capacity of those living in poverty (compared to those who are well-off) not to sub-par character issues and moral failure. They attribute it to the mental bandwidth tax: “part of their mind is captured by scarcity.” Would you and I make some of the same questionable decisions in similar circumstances that poor people make – like spending too much on basketball sneakers for a kid? It’s easy to say “no.” But, have you or I ever lived in chronic poverty? If we answer the latter question in the negative, we best leave the former questioned unanswered. We’ve all heard of slackers who do their darndest to game the system; some of these are in our own families. They, however, are the minority. In today’s America, a lot of the folks living in poverty are the elderly and children. Mullainathan and Shafir report that 50 percent of American kids today will at one point or another be on food stamps. It’s a great country, as the saying goes, but it’s also an incredibly unequal country. 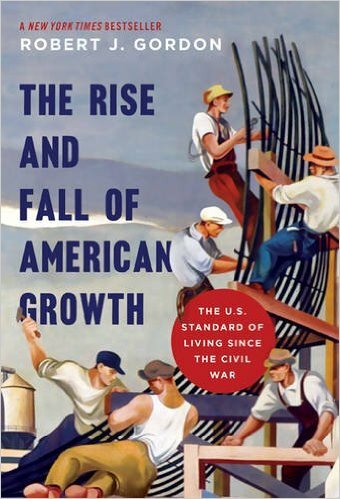 In my book Just a Little Bit More, I quote the English historian and economist R. W. Tawney who lived in a time of similar inequality to ours – the 1920s. Tawney spoke of an unequal society that lacked understanding of and compassion for those who lived in poverty: “A society which reverences the attainment of riches as the supreme felicity will naturally be disposed to regard the poor as damned in the next world, if only to justify making their life a hell in this.” Tawney wrote these lines in Religion and the Rise of Capitalism, published in 1926. Some things haven’t changed in close to 100 years. Mullainathan and Shafir do not shun individual responsibility as they encourage an expanded understanding of poverty and its causes. There is no substitute for hard work and personal responsibility for those desiring to rise above the poverty line. The co-authors do call for something they call fault tolerance – I call it compassion – for those living in poverty. Perhaps there is a single mother in your community, working a job that pays $10/hour, juggling childcare and household responsibilities, trying to pick up a class or two at the local community college. What does she need? She needs supportive family, friends, neighbors, and public policy that don’t further tax her mental bandwidth. She needs timely helping hands, an occasional day off, and political representatives and appointees that shape ethical public policy, in part, because they are in touch with her reality. As for your next diet, Mullainathan and Shafir have a suggestion: Sabbath. The traditional Jewish practice of rejuvenation, tranquility, and rest, Sabbath encourages a break from normal activity. According to the co-authors, food deprivation and trade-offs (adding up allowed calories and carbs, depending on types of food consumed) are activities of self-imposed scarcity that tax one’s mental bandwidth. Psychologically, this type of dieting is exhausting. Consequently, take a day off from your diet when necessary. Don’t blow it or ruin it by consuming all things forbidden! But, be compassionate with yourself – allow for some fault tolerance. Relax and let your mind reboot. 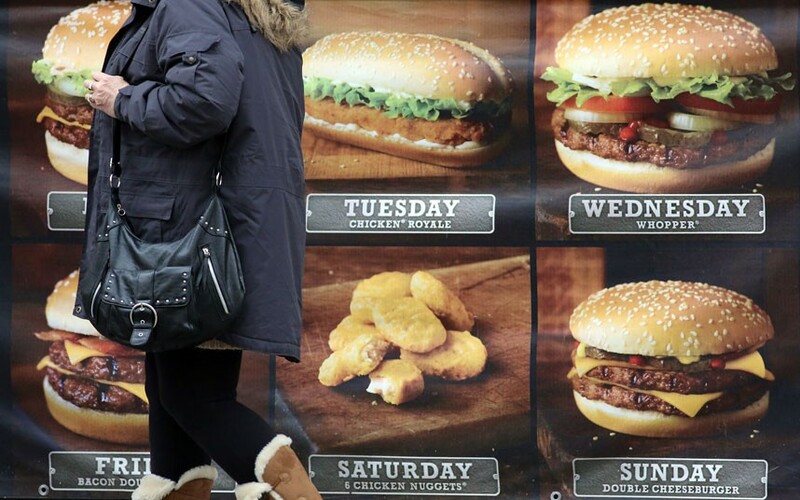 The very next day, get back on the diet and have a goal to stay on it for six days or so. Sabbath comes once a week, every seven days. An unexpected thing happened last May on a plane bound for Addis Ababa, Ethiopia. A group of ten adults was travelling to the historic East African country to work with the organization Water to Thrive. W2T is a faith-based non-profit dedicated to fighting one part of the global water crisis by bringing clean, safe well-water to those who need it in rural Africa. Jim Sorensen, a former missionary in Ethiopia and a W2T board member, went on the trip to serve as an experienced guide for the group. Mike Rinehart, bishop of the Gulf Coast Synod (ELCA), was a first-time participant wanting to learn more about W2T’s work in order to inspire greater support for W2T’s mission upon his return to the Houston area. Mr. Sorensen and the good bishop were seated near each other on the Boeing 777, and as they settled in for the fifteen hour trip, both reached in their carry-on bags and produced – did you guess? – brand new copies of Just a Little Bit More. They exchanged glances of surprise; this was more than mere coincidence. They had independently received a copy of the new book, and unbeknownst one to the other, had the same reading plan for the long flight over the Atlantic and the mid-section of the African continent. In just its second week of publication, JaLBM was making its way to Africa with two travelers committed to fighting the debilitating effects of lingering poverty. Both Jim and Bishop Mike get gold stars – as do a few hundred others – for reading the smaller font first edition of JaLBM. With a larger font, the second edition of JaLBM came out in October 2014 coinciding with the release of the ebook version. Close to 750 copies of JaLBM have been sold and distributed in its first year of availability. A big thanks goes out to people like Jim and Bishop Mike who have given their support to the book and its author! The purpose of the book’s publication and dissemination is to spur conversation and action that uplifts the common good in our midst, and in places throughout the world, like Africa. The summary version/study guide of JaLBM is now available. At fifty pages with probing discussion questions at the end of each eight chapters, it’s the perfect accompaniment to the full length version to facilitate conversation and exchange in group study settings. Seeking common good and kingdom connection is the JaLBM motto, as seen in the good work of a great organization like W2T! 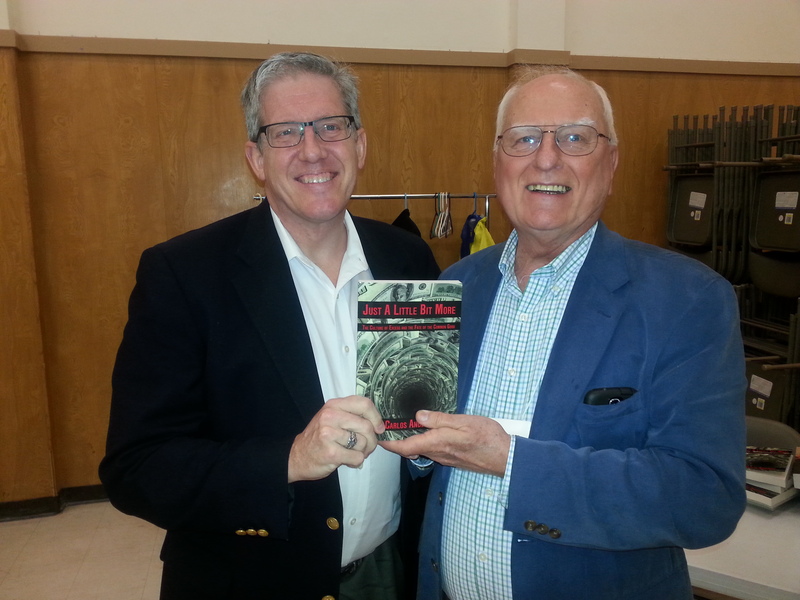 *Picture of Mike and Jim taken at 2015 Lutheran Legislative Event in Austin. ELCA stands for Evangelical Lutheran Church in America, a national church organization of 4 million people and 10,000 community congregations. Please visit the Water To Thrive website to learn more about the organization and how you can participate in its work. Click here to purchase Just a Little Bit More: The Culture of Excess and the Fate of the Common Good. Paperback, $14.95. 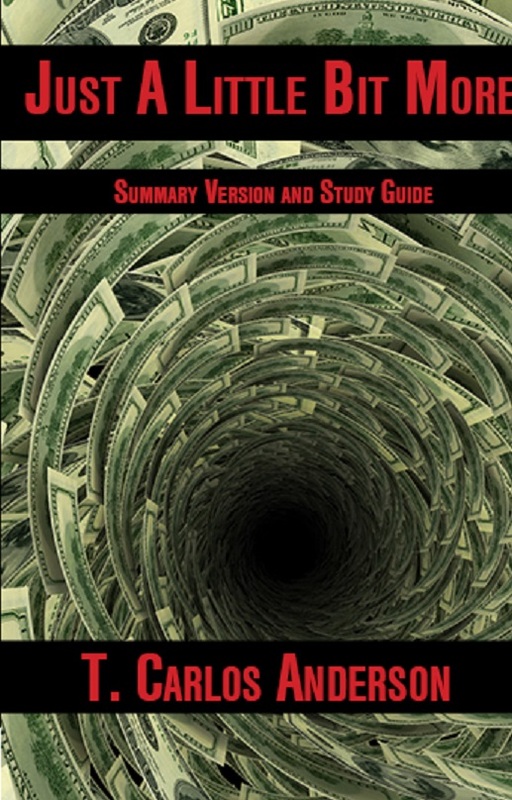 The summary version is available for $7.95. You will be redirected to the Blue Ocotillo Publishing website. Click here if you prefer to purchase full length paperback from Amazon. Ebook available on Amazon, iBooks, and Nook. Denise, my wife, and I recently visited her parents in Champaign, Illinois. While perusing The News-Gazette, Champaign-Urbana’s daily, an article reminded me that the esteemed political columnist George Will, like my wife, hails from Champaign, hometown of the University of Illinois. Will’s father, Frederick, taught philosophy at the university. The newspaper article I looked at celebrated its famous son, reviewed his career (he taught at Harvard early on), and trumpeted his future book, a comprehensive analysis of conservative politics. It was a good article; Will gave some excellent quotes covering politics and presidents from TR to Obama that made News-Gazette writer Paul Wood’s job that much easier. My hometown daily, The Austin-American Statesman, runs a George Will column once a week. From the looks I’ve given those columns over the past couple of years, it’s apparent that Will now preaches more often than not to the Republican choir. He’s certainly not a lap-dog for the all the typical Republican causes – he was critical of the Bush-Cheney Iraq war, continues to be critical of the Nixon/Reagan-initiated “war on drugs,” and is an opponent of “too big to fail” Wall Street banks. However, his recent departure from ABC News (after a thirty year plus run) to partisan Fox News solidifies the perception that Will is simply speaking to the base, and not reaching out to independents or Dems. The A-AS also runs conservative political columnist David Brooks once a week; I read Brooks’ column every chance I get. Brooks intentionally writes for a wider audience and covers topics without having to make partisan political reference. Brooks’ presence on NPR also broadens his appeal (except to those, of course, on the far right). A recent Will column, “Questions for attorney general nominee Loretta Lynch,” showcased some of his conservative wisdom: the bloated incarceration rates in America as unjust and expensive, and the rise of civil forfeiture – the seizure of property suspected of being involved with criminal activity – as unconstitutional. Will’s last point in the column, however, exposes a weak point symptomatic of today’s pockets-of-isolation American society. I can’t substantiate the following assertion as I don’t know Dr. Will personally, but I’m quite confident of its veracity: George Will doesn’t know anyone who is poor. Today’s America is separated into socio-economic enclaves of like-minded folks. I’ve referenced Bill Bishop’s The Big Sort (Mariner, 2009) previously in this blog; he’s shown that unlike American neighborhoods of a couple of generations ago, today’s American neighborhoods rarely allow for a mechanic to live next door to a medical doctor. Furthermore, wealthier people increasingly do not interact with those who are economically poor, except in situations of work or service. And in these instances, first names and amicabilities are seldom exchanged. Even so, wealthier people certainly will talk derisively about people who are on the lower ends of economic markers – 2012 presidential candidate Mitt Romney’s infamous “47 percent” gaffe being the most indicative. George Will doesn’t know anyone who is poor. Poverty rates in America by ethnicity: whites, 10 percent; blacks, 27 percent; Latinos, 24 percent. Republicans favor voter ID laws out of concern for voter fraud, which has been shown to be rare. Democrats, remembering an American history of voter exclusion by numerous categories and tactics, oppose voter ID laws out of concern for minority voter suppression. The economically poor, however, have had low voter turnout rates for decades and initial studies in this new era of voter ID laws do not show lower voter turnout rates among their ranks. But, it’s a plain fact that not everyone eligible to vote has a government-issued photo ID. Who are these? Generally, they are younger Americans, those not college educated, Latinos, and those living in poverty (regardless of ethnicity or age). It costs money to have access to a car and have an accompanying drivers license, to arm oneself with a handgun (its photo permit an acceptable form of identification in order to vote in Texas), or to have a passport (another form of ID acceptable for voting in most states with voter ID laws). Requiring a photo ID at an airport in order to fly? Yes, of course, that’s a necessity in the post-9/11 world. But, again, it costs money to fly. Generally speaking, people living in poverty don’t do a whole lot of cruising in cars to an airport, .22 pistol in the glove box, ready to hop on a flight – domestic or international. And what about the requirement that visitors to the Justice Department have a photo ID to get in? Yes, of course, for the protection of all in the building, entry through a metal detector and the offering of a photo ID is a necessity (until iris-recognition biometric technology is perfected). And what percentage of Americans ever enter the DOJ headquarters in Washington, D.C.? Answer: an incrementally small percentage. The topic at hand is not access to a privilege – car or gun ownership, a seat on an airplane, or entrance to a tightly secured federal building. The topic is voting – according to the Constitution – “a right” conferred to all citizens. The right to vote is taken away from convicted felons, but living in poverty is not supposed to be an obstacle to the ballot. It’s easy enough for middle- and upper-class folks to comply with voter ID laws; the requirements of these new laws reflect middle- and upper-class lifestyles and values. The new voter ID laws were written by people who, like George Will, for the most part, don’t know anyone who is poor. Getting voter eligible identification cards into the hands of those who don’t have a photo ID is a pragmatic solution. Of the 34 states putting the voter ID laws into practice, how many are allowing for a “grace period” (two years seems reasonable) so that the estimated 10-12 percent that don’t have drivers licenses can procure a government-issued ID in order to vote, complying with the new laws? There’s no questioning that George Will is a brilliant scholar and commentator. His brilliance is tarnished, however, by something that plagues many well-to-do Americans: not having personal relationships with anyone living in poverty, their understanding of their poorer neighbors’ reality is jaundiced – often loaded with judgment and lacking of deeper insight and compassion. Sorry, I Don’t Know Anyone Who is Poor . . .
Do you have a friendship with anyone who is poor? Since writing and continuing my work with Just a Little Bit More, I’ve had a lot of conversations with others in my own socio-economic status range – upper-middle – about those in our society who live in poverty. Currently, the US poverty rate is around 16%. (I’m aware that there are some who bicker about the rate – how it’s determined and calculated. I’m using the government poverty threshold rate – for 2014, income of $23,850 for a family of four – which helps lend consistency over a fifty-plus year period, going back to 1959 when the US government published the first national poverty rate – 22.4%.) A lot of folks in the upper classes talk about the poor in our society, but the majority of those who speak don’t know – not by acquaintance, and certainly not by friendship – anyone who is poor. Author Bill Bishop tells us why this is so in his book The Big Sort: Why the Clustering of Like-Minded America Is Tearing Us Apart (Houghton Mifflin, 2008). He argues that even as America becomes more diverse in overall demographics, we increasingly live in neighborhoods – and socialize – with people who think, vote, and sort their values just like we do. Remember the days when a mechanic and a doctor could be next door neighbors? The America of yesteryear was segregated racially; the dominant segregation in today’s America is socio-economic and often political – reflecting, in part, the polarization that dominates our strained social interactions. Bishop claims only 25 % of American counties in the 1976 presidential election were deemed landslide (more than a 20 point margin of victory); in the 2004 presidential election over 50% of American counties were landslide. Sorry, I don’t know anyone who is poor, but I certainly have an opinion about the poor. So true. I’ve learned by listening to middle/upper-middle/upper class folks (white, mostly – all my Latino and African-American friends and acquaintances do know people who are poor) to know what they say about those living in poverty, because I’ve been asking this question consistently for a couple of years when conversing about social inequality: Do you know anyone who is poor? The answer typically breaks down into four opinions/viewpoints: 1) personal knowledge (or an anecdote heard) of a bona fide slacker who doesn’t work and sponges off the government; 2) the story (the one answering the question) of his/her rise from poverty back in the 1940s or ’50s (the implication being that social mobility is alive and well in America); 3) the claim that poor people lack discipline and are lazy – again, the implication being that social mobility is alive and well in America; and, 4) the reality that people living in poverty in the United States have it so much better off than poor people in other parts of the world. Yes, there are bona fide adult slackers who sponge off the government – without question. It’s tempting to think, however, if you don’t know anyone who is poor – the law of generalization – that all people living in poverty consequently fit this same pattern. Those of us who know people living in poverty realize that such a generalization is nowhere close to the truth. A small minority of adults sponge off the government; consider that half of those living in poverty in the United States – some 22.5 million – are children or elderly. The United States has an abysmal 23.1% child poverty rate. According to a 2012 UNICEF report of the thirty-five richest countries in the world, the United States ranks 34th in childhood poverty. Thanks to Romania’s rate of 25.5%, we avoid the cellar in childhood poverty rankings. As for social (or economic) mobility – work hard, save money and you’ll succeed by moving up – it works well for middle and upper class, educated Americans (with the usual caveats for ethnicity, gender, and sexual orientation). But that same rate of social mobility doesn’t apply to those who are born into poverty, especially among ethnic minorities. The former group – higher classed and educated – is privileged, systemically. Today it’s best to be born rich in America: it’s three times more likely as compared to a generation or two ago that your father’s income will determine your own income. Upward social mobility, overall, is not what it used to be in America. And, yes, those who are poor in American have it much better off than those who are poor in Africa, India, Russia, and China. My mother tried to get me to eat my boiled asparagus by referencing the starving hordes in Africa (or was it China? ), but it was largely unsuccessful. I had no idea or vision of what life was like in Africa. That type of comparison thinking was too abstract for my juvenile mind to process, especially when it was fully engaged in potential strategies to avoid the mushy asparagus that sullied my plate. Similarly, personal income differences within countries matter much more than income differences between countries. Economic differences can and do serve to motivate the less fortunate to aspire to greater heights, and poor people living in America can count on a better social safety net than poor people, for example, in Belarus. But, prominent economic deprivation in relation to the rest of society is what can warp a young mind and spirit, because the differences are blatant, noticeable, and real. And if the opportunities to advance are few and far between, then many of the social variables affected by poverty (incarceration, teenage pregnancy, and school drop-out rates) are simply and sadly reinforced. Do you know anyone – a friend or someone who is more than a passing acquaintance – who is living in poverty? Linda Tirado is someone who has lived most of her adult years in poverty. Her book Hand to Mouth: Living in Bootstrap America (G. P. Putnam’s Sons, 2014) tells it like it is. She got lucky; a blog post of hers that described living in poverty went viral and she ended up with a book deal. As she rightly claims, it’s more like she hit the lottery than worked her way up via a vibrant economic mobility. Her book is a top-seller and she tells a tale that is compelling, insightful, and real for many Americans. There are those, of course, who attempt to dismiss her telling of the tale of living in poverty in today’s America as overdone and exaggerated. I’ve read her book and done my own bit of investigating. Whereas she can tend toward over-generalizing (I’m guilty of the same charge at times), how often does a minority or shunned voice get the stage? She liberally uses profanity, but her voice is genuine. She speaks for a number of Americans who are rarely heard. This blog post and others on this website are representative of my views and writing in Just a Little Bit More: The Culture of Excess and the Fate of the Common Good, available at http://www.blueocotillo.com, Amazon, or any other bookselling venue. Pick it up with Linda Tirado’s Hand to Mouth – highly recommended! How much money do you make? Do your possessions measure up to your neighbor’s? What does your car or truck (I live in Texas) say about your social status? The level of importance we lend to the answers of these questions determines the extent to which we are playing the game. The confluence of commerce, materialism, and consumerism is the game – and in my book, Just a Little Bit More, I call this game the dominant force in American society. It has its good side: playing the game puts food on our tables, clothes on our backs, roofs over our heads, and money in our bank accounts. Not only that, it gives us purposeful activity and work (most of the time) that benefit fellow members of the human family. The playing of the game, however, can go too far. Americans work more hours than we used to, and the heightened pursuit of possessions and goods drives us into greater debt. Instead of the promised joy and fulfillment these possessions seem to promise, we can find ourselves stuck in a cycle of depressing and anxiety-producing consumption. This game will rule those who devote themselves to it. The Gilded Age (1870 – 1900) was a previous era of societal fixation on material consumption. American economist and sociologist Thorstein Veblen coined the term “conspicuous consumption” in 1899 to describe the spending by the richest Americans to build up their own prestige and image. Whether the Gilded Age or today: Isn’t it interesting that we almost always “compare up”? It can serve as positive motivation to see that your over-achieving neighbor has bettered her standing and that of her family by a combination of hard work and fortuitousness. But, comparing up – evaluating your status in contrast to your neighbor who has more – can also erode a sense of shared community and eliminate a feeling of gratitude for what one does have. Since the 2007-08 economic swoon, to be a part of the richest 1 percent – unless your name is Donald Trump or Tom Perkins – has not been something about which to toot your horn. If you live in a household that has a yearly income of more than $383,000 in the United States, you are a 1 percenter. Most of us (but not all) reading this blog are not 1 percenters. There is nothing inherently wrong with being a 1 percenter. If it gives you a certain sense of relief to not be included in that exclusive grouping, momentarily repossess your unease. US households that take in $140,000 a year are included in top 1 percent of earners globally. Perspective is important; the United States has more 1 percenters than we might think . . . The United States, because of advanced development and sheer strength of population, has half of the world’s richest 1%. Seventy million people make up 1 percent of overall world population (7 billion), and the United States has some 35 million people (about 11 % of US population) that are part of households that take in more than $140,000 a year. The remainder of the global richest 1 percent primarily come from Britain, Germany, France, and Japan. Conversely, 2.5 billion people (35% of world population) live on less than $2 a day, the majority of these being women and children. An incredible reality – and let’s not bicker about the definition of poverty – that one in every three humans lives with significant material deficiencies. Thankfully, we don’t have to worry about those who live in poverty. This attitude – screw the poor – is also part of playing the game. All we (who don’t live in poverty) need to do is work and consume and the gate-keeper of the game, the Market, will take care of the rest! We just buy stuff and consume to our hearts’ content and we don’t have to worry about those “below” us. If they want some of what we got, let them get in the game and work for it. True enough for some, but not universally true for all. Adults, whether living on $2 a day or $383,000 a year, are responsible for their own actions and suffer the consequences of bad choices. Yet, it’s a fallacy (and if you identify as religious, it’s idolatrous) to believe that an ever-expanding market system will provide all that we and everyone else will need. A regular reader of this blog, in agreement with the principles brought forth in Just a Little Bit More, asked me: So, what are we to do? Answer: Inform yourself and stay up to speed on the topic of inequality, be part of the conversation (especially with the younger generation currently being initiated into the lures of materialism), and, take positive action. Perhaps the most important part of taking positive action is to make sure you’re not playing the game. If you’ve got enough to eat, if you own a house that is in good shape, if you are shepherding a vehicle or two (or three) . . . and you’re still playing the game – then it might be time to reconsider your values and your goals. The game is good up to a point. But beware: the continual striving for more and more, as with an addiction, eventually satisfies less and less. Compare down for a change. You might see a new reality and be inspired to play the game in a different way. Thanks to Pastor David Moore of Austin, Texas for the suggestion, via conversation, of this topic. David, in talking on this topic, prefers to use a basis of individual earners as opposed to households. Using individual earners lowers the threshold considerably for top 1 percent earners globally – down to about $50,ooo a year – as non-workers (children, mostly) in households are disregarded. Pastor David’s Moore’s website: http://www.twocities.org.